For many models, animations are the most noticeable and most important feature: Animation sequences define how a model moves, behaves or transforms over a period of time. Animation sequences, like the model itself, are typically created by the model artist before the model is imported into the Model Editor. The Animations pane lists all animation sequences in the model. 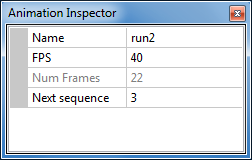 A single click on an animation sequence selects it, a double click opens the Animation Inspector pane as well. 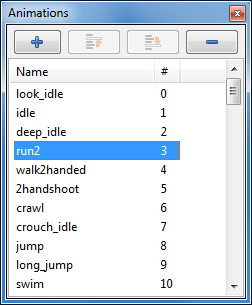 Pressing the F2 key or a single-click on an already selected animation sequence allows you to rename the sequence in place. The “+” button imports a new animation sequence (e.g. from a .md5anim file) and adds it to the list. The “-” button deletes the currently selected animation sequences. Inspect/Edit opens the Animation Inspector pane. Rename allows to rename the animation sequence. Import…, like the “+” button, imports a new animation sequence (e.g. from a .md5anim file) and adds it to the list. The Animation Inspector pane shows the details of the currently selected animation sequence. Shows the name of the currently selected animation sequence. The name can be edited in order to rename the sequence. The speed in frames-per-second with which this animation sequence is played. It's normally set by the model artists and needs only be changed e.g. for special effects such as slow motion, or if the right number was not correctly imported from the original model file, etc. The number of key frames that the sequence consists of. The key frames are created by the model artist and cannot be changed here. This is the number of the animation sequence to play after the current sequence. This value is set to -1 to indicate “no” next sequence, which is used for animations that should just stop when they've reached their last frame. For example, a sequence of a player model for dropping to the ground after it was mortally wounded typically has a next sequence value of -1, indicating that this is a “non-looping” sequence. Setting the value to the same number as the number of this sequence means “play this sequence again when its end has been reached”. It's another way of saying that this is a looping sequence, such as walking or running. Setting the value to a number other than -1 (“non-looping”) or the own sequence number (“looping”) can be useful to indicate logically consecutive sequences. For example, if a player model has a sequence for holstering its weapon, the “next sequence” value might be the number of an idle sequence – whatever the player does after he has the hands free. In summary, note that the “next sequence” setting is mostly used to indicate looping vs. non-looping sequences, and that often the game script or C++ code will override whatever has been entered here: The model artists and the game programmers will have to communicate regarding the exact purpose of the animation sequences in order to make best use of this feature.